If you're a ice cream lover, here's a Twitter competition for you. We have teamed up with our friends at Ice Cream Union to offer you the chance to have your dream ice cream made. And that's not all! They'll even sell it at their market while stocks last. If this sounds like your idea of heaven, tweet @LDNBridgeCity your ice cream idea for the chance to win! 2. The competition is open to residents of the United Kingdom aged 18 years or over. Entries are accepted from ages 18 years and below but must get permission from a parent of guardian in the case they win the competition. 3. Employees of London Bridge City and their close relatives and anyone otherwise connected with the organisation or judging of the competition are not permitted to enter the competition. 6. Route to entry for the competition and details of how to enter are via Twitter. 8. Closing date for entry will be 30th July 2017. After this date the no further entries to the competition will be permitted. 10.The rules of the competition and how to enter are as follows: To enter, tweet London Bridge City your idea for a new ice cream flavour to be made by Ice Cream Union. 13. 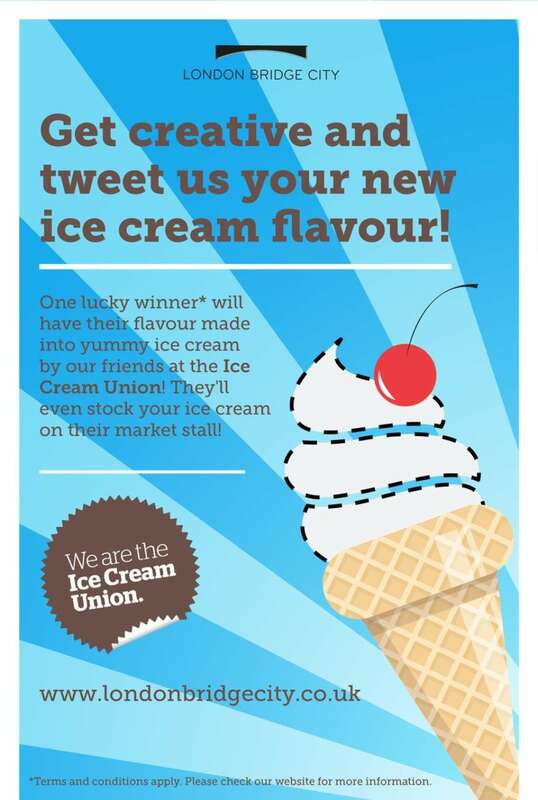 The prize is as follows: The winning ice cream will be made by Ice Cream Union. This will be given to the winner and stocked at their market stall (while stocks last) as the London Bridge City Summer Festival flavour suggested by the winner. 14.The prize is as stated and no cash or other alternatives will be offered. The prizes are not transferable. Prizes are subject to availability and we reserve the right to substitute any prize with another of equivalent value without giving notice. 15. Ice Cream Union will judge the competition and decide on the winner by Friday 4th August 2017. 16. The winner will be notified by Twitter. If the winner cannot be contacted or do not claim the prize within 7 days of notification, we reserve the right to withdraw the prize from the winner and pick a replacement winner. 17. The promoter will notify the winner when and where the prize can be collected. 24. This promotion is in no way sponsored, endorsed or administered by, or associated with, Facebook, Twitter or any other Social Network. You are providing your information to London Bridge City and Ice Cream Union and not to any other party.